Lightweight, affordable style for any garden. Supplied as a pair of 30cm (12in) Plastic Planters with an aged-white finish. (Appears very light grey). Create a statement in your garden with this pair of aged-effect planters. Reproducing a classic pattern, these weather-resistant, plastic planters are UV stable and will really last the test of time meaning you can use them year in, year out. Great value especially when compared to normal prices for metallic or ceramic pots, yet you still get a timeless and classic look! 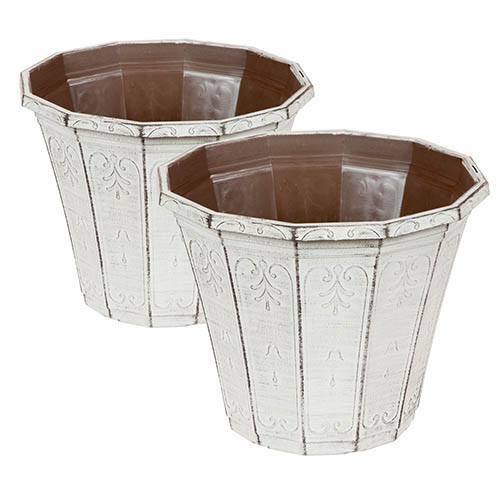 Perfect for bulbs, bedding, shrubs, houseplants and more, these stunning pair of metallic looking planters will add an exquisite decorative look to your home or garden, without the cost of real metal pots. Hand finished in white paint, using a brand-new technique developed last year, they will add a touch of class to your home or garden. Made from heavy-duty injection moulded plastic, they're lightweight, tough and durable, and also frost and UV resistant, so they’ll withstand the worst of our British weather too! Each one has drainage holes to allow water to freelyt escape and therefore let your plants thrive! An elegant and stylish pair of pots, they also make a great contemporary feature and are a great investment - they'll really help to show off your precious specimen plants. Finished off with a stylish, aged-white finish (appears very light grey), they will certainly help to provide spectacular garden displays for years to come! Brilliant value, we supply 2 x 30cm (12in) Plastic Planter.